Silver Spring, Md. 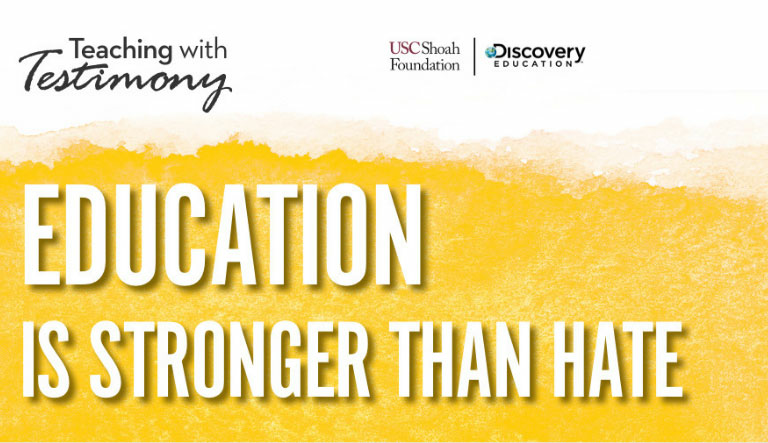 (Monday, November 5, 2018) – In an effort to spark a social movement against hatred in all forms, and to commemorate the 25th anniversary and re-release of Schindler’s List, USC Shoah Foundation and Discovery Education, the leading provider of digital content and professional development for K-12 classrooms, have partnered to create Teaching with Testimony – a new educational program that unlocks the powerful classroom potential of testimony. Drawing upon USC Shoah Foundation’s vast library of audiovisual testimony from survivors and witnesses of genocide, Teaching with Testimony empowers students to find their voices and take action for a better future. Comprised of a series of standards-aligned resources for middle and high-school students, Teaching with Testimony challenges students to employ empathy, build critical-thinking skills, and become inspired to create a brighter future after listening to first-hand accounts from survivors and witnesses of genocide. In addition to being deeply integrated into sections of Discovery Education’s Social Studies Techbook, Streaming Content Collections, and Professional Learning offerings, the program includes digitally immersive classroom resources, a student video challenge, Virtual Field Trips, and activities that provide educators with the tools they need to teach students to ultimately counter hate and respond to injustice. Additionally, to create enriching and exciting experiences outside of the classroom, USC Shoah Foundation has collaborated with Comcast Universal to sponsor exclusive Schindler’s List free educational screenings on December 4th and 5th. The screenings will welcome high school students at select theaters in major markets to commemorate the 25th anniversary of the film’s release. Teaching with Testimony resources are available at TeachingwithTestimony.com and are integrated into Discovery Education’s Social Studies Techbook, Streaming and Espresso. For more information about Discovery Education’s digital content and professional development services, visit discoveryeducation.com. Stay connected with Discovery Education on Facebook, Twitter, Instagram and Pinterest @DiscoveryEd.